This book contains 22 classic songs that were recorded by The Beatles. Maeve Gilchrist has arranged them for 22-string or larger harps. 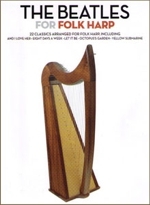 All the pieces are in the key of C, with no lever changes, so you don't even need to have sharping levers on your harp! Both hands are written in the treble clef, and the lowest note is the G right below middle C. All of the songs stay within a 3-octave range. Chord symbols are included, but no fingerings. Some of the pieces can be played by beginners, but many are for advanced beginner to intermediate due to some tricky rhythms. Most of the pieces are by Lennon & McCartney, but others, such as Please Mr. Postman, Act Naturally, and Twist and Shout are by other composers.